In March of 2003, dismayed by both the imminent war in Iraq and ongoing U.S. defiance of the global community, Thomas Ingmire invited approximately eighty friends and colleagues to participate in a collective calligraphic project on the subjects of war, fear, and peace. 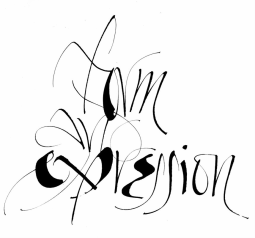 Each person was asked to write out a statement on a 5" x 20" sheet of paper and send it to Thomas, who would then arrange these pieces into a work that would be shown as part of the Friends of Calligraphy exhibit, Kalligraphia X, at the San Francisco Public Library. Thomas also requested that the participants invite their friends, families, and colleagues to contribute statements; children, in particular, were encouraged to take part. More than 750 people from twenty-eight nations responded. With the invitations issued and pieces arriving daily in the mail, Thomas set about exploring various formats he might use as the unifying structure for the project. It soon became clear that creating a work whose "whole was greater than the sum of its parts" was going to be a challenge. Meanwhile, something unexpected was happening: Thomas began to realize that the participants' statements were raising questions for him which often felt as provocative as the statements themselves. One such question was if a war is already in progress - or, in the case of Iraq, about to begin - then no matter how eloquent or heartfelt the protests against that war, do they come too late? A war does not simply start on one day and stop on another; its roots run wide and deep. If we truly want peace, Thomas reasoned, we must do more than protest against war at the eleventh hour. Instead, our day-to-day lives must reflect that desire. Thus the question "how do we achieve peace?" became for Thomas the more encompassing question "how are we to live - as individuals, as nations, as fellow inhabitants of the Earth?" and from that one question, not surprisingly, sprang many others. Thomas decided to incorporate these questions into the work with the hope that they would prove thought provoking and even, perhaps, inspirational. Ultimately, he chose lanterns to serve as the structural heart of a sizeable installation. The lantern - a symbol not only of the desire to bring light into a world which seems so increasingly dark but also of the challenge which faces us to become more enlightened in and about the world-was a perfect choice. HOW CAN ONE PERSON KILL ANOTHER PERSON? COULD YOU? CAN THE WAR BE OVER IF PEOPLE ARE STILL DYING AND BEING KILLED? DOES THE NOBEL PEACE PRIZE SERVE ANY PURPOSE? WHY AREN'T WE FIGHTING FOR OUR RIGHTS AND FREEDOMS? WHY ARE WE SO CERTAIN THAT GOD IS ON OUR SIDE? THOU SHALT NOT KILL." SO HOW CAN WARS BE WAGED IN GOD'S NAME? FREEDOM OF THE PRESS? THEN WHERE ARE THE FACES OF THE CHILDREN THAT WE KILL? HOW ARE WE TO LIVE? WHY WON'T WE AGREE ON A MORAL CODE? HOW DO YOU LEARN TO TRUST THOSE YOU FEAR? WHY DO WE DERIDE PEACE-LOVING PEOPLE? WHEN DO PATRIOTISM AND DEMOCRACY WORK TOGETHER? HOW COULD WE HAVE LET GEORGE W. BUSH BECOME PRESIDENT OF THE UNITED STATES? DO YOU VOTE? IN EVERY ELECTION? ARE HUMAN BEINGS AN EVOLUTIONARY MISTAKE? DO YOU OPPOSE WAR? WHY? WHO IS GOD ANYWAY? AND WHY ARE THERE SO MANY OF THEM? WHAT DO YOU MEAN BY "FREEDOM"? S FREEDOM WORTH ANY PRICE? WHAT IS THE PROBLEM? IS IT FEAR? IS IT GREED? IS IT SOMETHING ELSE? CAN ARROGANCE AND STUPIDITY BE MISTAKEN ONE FOR THE OTHER? PEACE? IN A WORLD WHERE SO MANY PEOPLE ARE RUDE AND SELFISH? WHY DON'T GROWN-UPS FOLLOW THE GOLDEN RULE?